For at least one full generation, American views on food – particularly “good” food – have been shaped by Food Network. From Emeril Live and Iron Chef America to Chopped, our ideas of how to cook and our culinary aspirations have been captured by these shows, their catch-phrases and “rules.” Who, amongst those of a certain age, hasn’t said “bam” while salting a dish or doesn’t know that whoever tries to make risotto ends up chopped? But you’re not on Chopped, are you? So there’s no reason not to make risotto. The reason no one ever wins with risotto on Chopped is, frankly, exactly what makes it so good: time. That – time — plus patience, the right kind of rice and a few basic concepts yields a dish that’s creamy without any cream, rich yet not necessarily fattening, devilish but simple, and soft yet toothsome. It’s a study in contrasts and, done right, perfection. Start with the right type of rice. The most readily available risotto rice in America is Arborio. But any high-starch and medium or short-grain white rice can work. The basic idea of the dish is to cook the rice in broth so that the rice absorbs the broth gradually, loosening the starch in the rice and yielding the characteristic “creaminess” of the dish. But it’s easy to go too far or fast with the liquid. The dish should not be mushy. On the contrary, the grains of rice must retain a little bit of “bite,” a firmness and individuality for each grain. If you add the broth too fast, before the rice has absorbed the last batch, the result is a gooey, porridge-like mess. The key is to add just enough liquid to cover the rice and stir constantly, letting it fully absorb before adding more. While there are certainly a lot of traditional risotto recipes – zucchini and shrimp, lobster, risotto alla Milanese (beef stock, bone marrow and lard), asparagus, pumpkin – you can flavor it just about any way you like. My favorite is mushrooms, especially the wonderful porcini mushrooms that are native to much of Europe and particularly Northern Italy. Add in a some peas for color and sweetness, garnish it with tomato confit and you have a vegetarian main course that is hearty, refined and surprisingly easy. So long as you stir constantly, let the vegetable broth absorb slowly, and don’t try to make it on Chopped you will get a wonderful dish. Make the Tomato Confit. Combine the confit ingredients in a small sauce pan and bring to a boil. Immediately reduce to a simmer and continue to simmer for an hour. Begin making the risotto. Bring the stock to a boil in a saucepan and immediately reduce to a simmer. In a heavy, medium-sized pot, heat the olive oil over medium-high heat and sauté the shallots for 2-3 minutes. Do not let them color. Add the fennel and cook for a minute before. Add the rice and stir well, “toasting” it but definitely not allowing it to burn. If you do, bite the bullet and start over. Add ½ cup of the white wine and bring to a boil. Let the wine boil for about one minute and then stir, continuing to stir frequently – about once every minute and a half. Allow most of the liquid to evaporate before adding enough liquid – alternating between the white wine and the stock – to just cover the rice, each time stirring, allowing most of the liquid to evaporate and then adding more liquid to just cover the rice. Continue for about 15 minutes. Add the mushrooms and thyme. Turn up heat of the burner and add mushrooms. Cook, stirring, until they begin to lose their texture, about 5 minutes, then immediately turn the heat down to low and add the thyme. Cook, stirring, until fragrant, about 30 seconds. Season mushrooms with salt and pepper and continue to cook over medium heat until they are soft. Taste and adjust the seasoning. Add the peas and finish the risotto. When the mushrooms are cooked down and the rice is nearly done – about another fifteen minutes of cooking and adding liquid — add the peas and keep cooking until the rice is finished but not mushy. The rice must remain al dente with each grain distinct but the whole dish creamy. Season to taste with salt and let the dish rest for a minute or two. Plate the Dish. 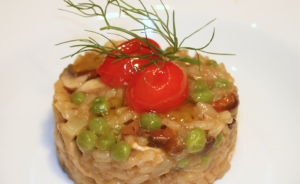 Spoon the risotto into a ring mold. Using a wine glass, spoon or spatula compress the risotto just enough to make sure it stays in place. 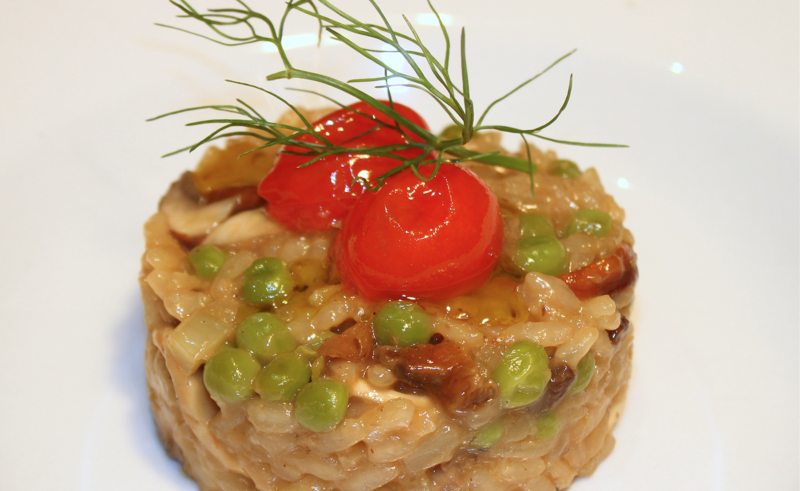 Arrange one teaspoon of tomato confit on top of each risotto. Arrange fennel fronds on top of the tomato confit.